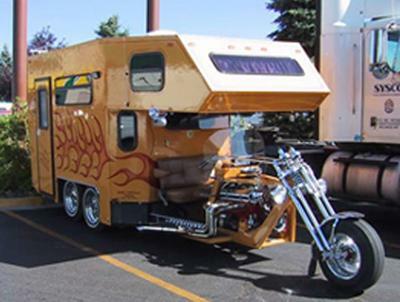 Came across this unique bike while searching Google for RV pictures and thought you might enjoy seeing it. what a GREAT idea.. how can I get ahold of one of these? That looks like a great idea...would love to "downsize" and retire with that vehicle! Join in and write your own page! It's easy to do. How? Simply click here to return to Readers Photograph Gallery!.